Are your kiddos journaling this summer? I am a huge proponent of writing – I think it is a crucial component of becoming a “good reader.” My girls love to write in journals and notebooks. It is so neat to watch them go from scribbles to more detailed pictures to scribble-writing to sentences! My six-year-old is writing full stories, poems, and lists of animal facts. My almost-five-year-old is doing mostly drawing and dictating her words to me. Although she likes to write the beginning sounds for words, too. A fresh journal is always inspiring, so the girls found summer journals at the table one morning this week. 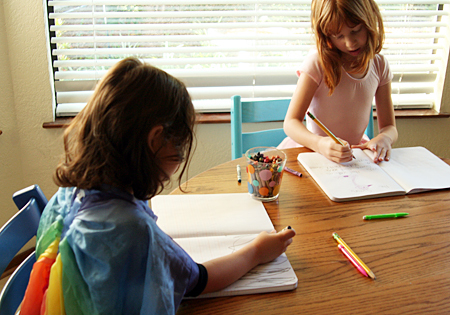 Set the journals out on the table with stickers, a stamp pad and stamps, or some paper shapes and a glue stick. Instant inspiration! Bring the journals in the car, on a nature walk, or to a restaurant. Print a few photos of a recent summer activity – glue a photo in your journal and write about it! Read a story, then write or draw about it. Sit on the floor and listen to some fun music while you draw and write. Make lists: 5 things that make you happy, 8 places you want to go, 4 favorite animals, 6 foods you like. Cut out magazine pictures and make a collage. I also told the girls that from time to time, I would write a note or story inside for them to read and enjoy. They seemed very excited about that! This is my kind of website!!! I am a former elementary teacher who loves kids, projects and learning. I stay home with my daughter now, but still tutor after school. I have my middle school student start a blog to keep up with his writing with this summer with his mother’s permission. Love the playdough recipe. I made tons of it for my daughter’s 1st b-day as party favors and also for a birthday cake making contest. I’m definitely going to link to that in the future! Ahhh! Sorry about the horrible grammar in the middle paragraph!!! What a great idea! I’m thinking it might be nice to send my kindergartners off with one before summer vacation. This is a great post! I just recently bought x-large moleskine cahiers so my girls can start summer journals! Thanks for the great tips on “maintaining interest”! I love the bright sunshine you drew to start your kids’ journals. How cool! That would provide instant inspiration for my kids, I’m sure! I just found your site and enjoy your blog very much. Maybe journals are a little early for us, but your ideas are great. Incidentally, I gave my daughter a small notepad and some stickers yesterday, and she was very excited to have her own “notebook”. She is not very interested in writing at the moment, and I hope to get her interested in it eventually. Love this idea!! But then I love most of your ideas! We recently did the alphabet crayons with the molds I bought from you last year……procrastinator I know…..they were a hit and a great birthday gift add on! My son keeps a journal at school but I never thought to continue it through the summer! I am giving you an award in a bit so stop on by! Great idea! I’m trying to write each day with my three year old. Starting the day as a ballerina and rainbow fairy seems like the perfect start to a summer day! Terrific post – my son recently asked for his own journal after an episode of “Sid the Science Kid”. He’s only 3.5yo and so there’s a limit to what he can do in his journal at the moment. But I will definitely keep your tips in mind to keep up his interest so that once he starts writing he can have a lot of fun with it. He will enjoy drawing and using stamps and stencils for the moment. I’m so looking forward to introducing my daughter to journaling some day (she’s only 6mo right now). It is one of my absolute favorite past times. Looooove these tips. I love journaling! When I taught high school I would make my student journal every class. I talked to one the other day who is now going into her senior year. She told me she still has her journals and looks back at them. She said they make her happy and they give her a good laugh too!! I homeschool now and used to have the kids journal but I let it go this year. I think we will be picking up the habit again. It is just too great an activity to let pass!